Well, the first time I encountered snaps was when I was porting KDE’s KWin and Plasma desktop to Ubuntu Phone — together with Wayland. Parts of Ubuntu Phone were already snappified. But until Michael Hall showed me his snapcraft definition for Krita, I only thought of it as a technology for mobile applications. It wasn’t much of an investment! Michael provided the script and showed me how to run it, and it was really, really, really easy. No runtimes, nothing complicated about it, so it takes about ten minutes of my time during release time to also make a snap. It’s pretty easy, really. I’m a bit of a clumsy bumbler when it comes to building, so on Windows, I build using a set of .bat files, on OSX it’s a several manual steps and two scripts, AppImages is only one script, and a manual upload step… Snap is one command and then a manual upload step to the store. I wish I had the time to setup something more automated for all the platforms I need to support, but that probably won’t happen until I find a volunteer. Currently beta and stable. I intend to add edge to that — I don’t see much use for the candidate channel for me. Boudewijn Rempt has been working on Krita since 2003. At first, it was just a hobby, something he did because he wanted to draw maps on my computer with a drawing tablet. From 2004, he became the official project maintainer, and that’s the role he still has. He’s not just coding on Krita and making releases — he also tries to grow Krita’s user base and make sure the project is vigorous and healthy. So he created the Krita Foundation to support development by actually funding full-time development, to release training videos and books and provide a focal point for the community to gather round. 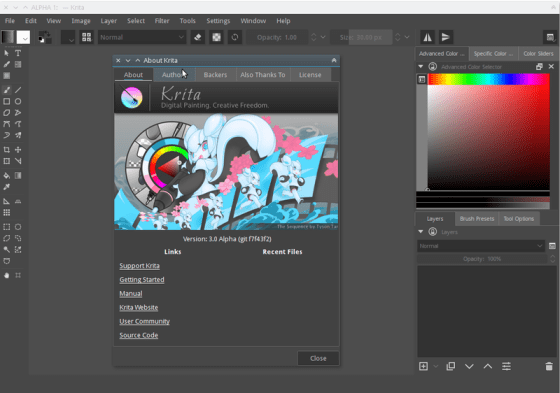 Krita started out as a Photoshop or Gimp clone. For some time they tried to keep that direction, adding stuff like a panorama stitcher for instance. But after 2007, the focus shifted to creating art from scratch. Then they decided that Krita would be first and foremost an application for digital sketching and painting, which turned out to be a great decision! Some people worried that there wouldn’t be enough people interested in just a painting application, compared to more general image editing, but 80,000 downloads a month on all platforms say differently!